In a city where imposingly handsome architecture awaits around every corner, the City of Edinburgh Council’s City Chambers in the Old Town is amongst the most venerable of this World Heritage Site. 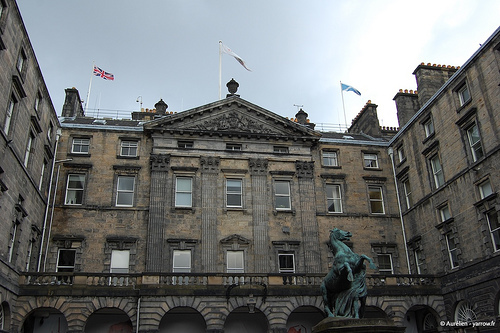 The neo-classical building, set back in an arcade-fronted courtyard from the High Street, part of the Royal Mile, was completed by John Adam in 1761 and was known as the Royal Exchange. A little over half a century later in 1811 the Town Council adopted it as its Chambers. The building is now the beneficiary of a rather magnificent £2.5 million refurbishment, which was completed in late 2008. The room at its heart, the ornate wood panelled Main Chamber, underwent a painstaking restoration that peeled back the years from its stained glass dome and brought back to life its original Edwardian vibrancy. On 21 January 2009, HRH The Princess Royal made an official visit to the refurbished building and unveiled a plaque commemorating the restoration. Rachel Simmonds, project architect with Smith Scott Mullan Associates, told the BBC that “the royal visitor had been impressed by the conservation of the Chamber’s huge glass-domed ceiling”. The City Council had also decided to restore their historic furniture including the Davenport desks and chairs which the chamber had originally featured when it opened in 1904 – but which had more recently been consigned to storage. The restoration and their considerable physical presence would, it turned out, support the choice of Beyerdynamic’s wireless Revoluto product as the right project solution for the wireless conference microphone system. The Council invited competitive tenders for the new microphone system. Among those included on the tender list was Surrey-based system integrators Impact Marcom, who had worked with Edinburgh City Council in previous years. Impact’s Frank McAllister explains: “When we were invited to bid we were keen to base our proposal on our earlier partnership with what was then Beyerdynamic GB, now Polar Audio Ltd”. He adds: “We got in touch with Conference and Presentation Manager Matt Nettlefold at Polar Audio and jointly put together a bid, having seen the new wireless Revoluto product, which was the very first of its type. We sent the client a ‘dumb’ sample and they liked the shape and design of it, in particular because it would fit in with the refurbished historic desks, and they felt that others, particularly those with gooseneck microphones, would not have suited the historic chamber setting. Additionally, this is a listed interior in pristine condition and going with a wireless system was a huge advantage in terms of both aesthetics and having zero impact on the structure, fabric and décor of the chamber.” Revoluto’s patented ‘Microphone Array Technology’ replaces gooseneck microphones with an array of 17 specifically calibrated recording capsules, creating a ‘corridor characteristic’ rather than the cardioid characteristic typical of standard microphone stations. This results in a wider zone within which the delegate can speak without affecting audio quality or volume level, whether they’re standing, seated or a wheelchair user. Its wide pick-up pattern obviates the need for precise microphone positioning. In Edinburgh’s case, the delegate microphone unit’s footprint of 300 by 92 mm fitted on to a specially designed ‘platen’ as a new element on the desk. This platen was prepared by the furniture restorer as part of the conservation works and fully complements the desk’s character. The system feeds a new PA system, using the Revoluto units’ internal loudspeakers for personal reinforcement, along with a separate recording system, all working under an AMX control system that also commands the blackout blinds and projectors. The original brief identified a few principal issues to be addressed in choosing the new system. Firstly, Council meetings now last much longer than they did in the past. The Council’s minimum requirement was for continuous battery life of at least of 15 hours. Secondly, there was the issue of sound pick up – people may be sitting but very often they’ll also stand up in order to respond to a colleague or make a point in a debate. The Revoluto system’s wide pickup also provides that higher reach when speakers are on their feet. It also looks better than pushing microphones around on the desks. A third factor was the location of the microphone units on the historic Davenport desks. These have a sloping top with a flat ledge at the rear. A standard system with a gooseneck would have to sit on the slope where people place their papers. The Revoluto units fit the new flat ledge, which combines a wooden lip to locate them centrally on the platen, plus space for a glass water carafe and glass. The carefully designed solution integrating technology that’s state of the art with beautifully restored antique furniture is a first for a Revoluto installation. The result of the installation is that all 58 Councillors’ desks and the eight senior officials’ podium positions now boast individual Revoluto units, whose wireless portability and a wheeled flightcase housing the battery chargers, also allow them to be moved to other rooms within the City Chambers in minutes when the need arises.